Mad Hatter No More: Use Probiotics to Clean! 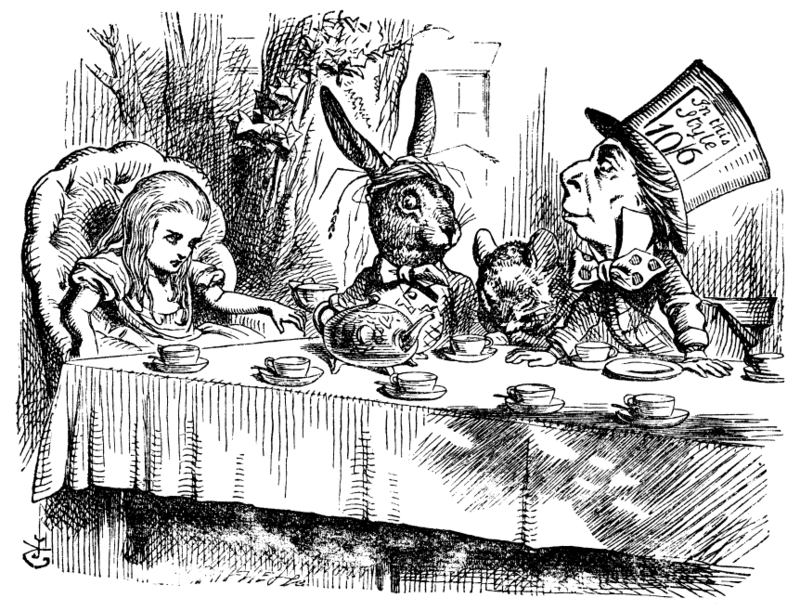 There are a handful of answers, but why Lewis Carrol’s hatter was mad is simple: mercury poisoning. When Alice in Wonderland was written, top hats were made with mercury. The hatters experienced continued exposure to the mercury fumes. Subsequently many were poisoned causing a variety of mental issues. In honor of the 30th anniversary of Mad Hatter’s Day, a day to celebrate the quirky book character and being a little silly, we look at safer alternatives to a common household hazard: chemical cleaners. Natural cleaning reduces chemical exposure & health risks. We know eco-friendly products help to save the Earth. We also know eating healthy, natural food is better for us. However, being environmentally conscious isn’t just about preserving the natural world, but our man-made one as well. Products used in our everyday lives shape our health. Cleaning your home reduces your risk of illness, but the chemicals commonly found in many of cleaning supplies can be just as harmful as a dirty house. Extended exposure to chemical fumes causes respiratory irritation, headaches, and worsening asthma. Fret not. Alternative exist. Cleaning products with probiotics break down dirt and grime naturally. These products clean a variety of surfaces while being safe for your family. Probiotic cleaners are pet friendly too! Take a lesson from the Hatter, use less chemicals. Clean naturally. Five months out of the year, football dominates the nation’s TVs. Also called the pigskin, NFL footballs were originally made from pigs. Now, they’re cowhide leather. In fact, NFL footballs are still hand crafted by the same company, all 11,520 of them. And that’s just for the regular season! 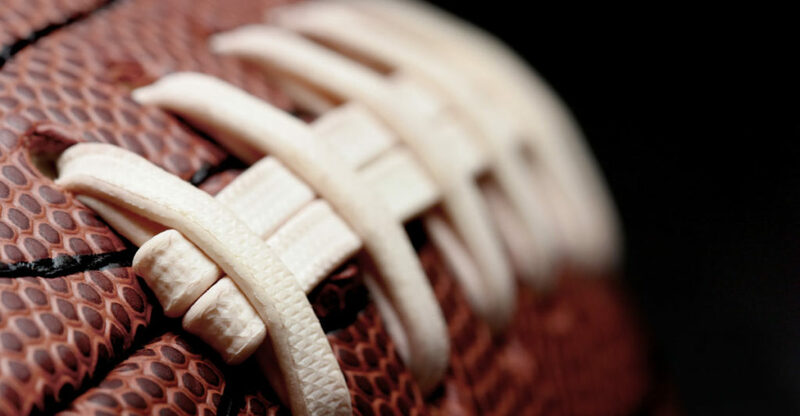 As a result, 35,000 cowhides make footballs each year. Additionally, creating footballs uses thousands of gallons of water and chemicals each season. Tanning, the process of making leather for consumer goods, is an old practice. Thus many tanneries use the same methods as past craftsmen. But new, more natural options are out there. Probiotics are a natural alternative to traditional, chemical based treatments. Yes, the same bacteria that support your digestive health are part of a sustainable way to prepare leather. Okay, not the same type. But, these products can replace the traditional chemicals used to make leather. This reduces the environmental impact of the leather industry. Also reducing the carbon footprint of leather products, like footballs. Making the world a little greener. And Astro Turf, too. For more the latest industry news, tune into our weekly blog. The things we put on our faces! From creams to make-up, it’s a wonder we all don’t suffer from consistent red-face. The beauty industry is huge– $56.2 billion huge actually- and influences most every one on the planet. Even if you think you avoid it, things such as oral care and deodorant are all part of this huge market! We all contribute! Unfortunately, this industry is a little…. sneaky. Most of their products actually cause the things they’re fighting or protecting against, making us buy more of it. Weird, huh? Specifically in the health and beauty industry, many products CAUSE what we’re trying to prevent! To protect yourself from this sabotage, here are a list of products to be suspicious of and some all-natural beauty alternatives! Acne is a huge problem in the world, especially for teens and young adults. The OTC products we use to fight it, most of which contain salicylic acid, can work wonders for some. However, that acid strips your skin of a lot of healthy minerals and bacteria, leaving your skin dry. Having dry skin seems to be better than having oily skin, but unfortunately, over-drying your skin actually makes it more oily! And can cause more zits! YUCK. The best way to defend against this problem is to use products with benzoyl peroxide, a less harmful chemical, or to put a type of probiotic on your face to balance out the skin’s natural processes. Get this- most shampoos and conditioners can dry out your hair. Which, much like the acne treatments, cause your hair to become oily much faster… making you wash it more often… making you buy more shampoo. See how trend? How devastating! The truth is, our hair only needs to be washed about 3 times per week. Please note: you still must shower every day, but getting your hair wet and washing it are two completely different things! Water is one of our favorite all-natural beauty alternatives, but it can’t supplement for soap forever! However, not washing your hair as much will help re-balance your hair’s microbiome, making its washes last longer! Not too surprising here, but heavy makeups, like foundations and mascaras, are actually relatively bad for your skin. Foundations, while covering up blemishes, can actually make matters worse. Most foundations contain bad oils and can cause sebum to pack into your covered up pores. Likewise, mascara is actually pretty bad for you, too. The brushes on mascaras are typically germ-ridden and can irritate your eyes and lashes, actually making them fall out! All in all, when it come to make up, less is DEFINITELY more. Look for foundations that are oil free and mascara that isn’t too chunky. This will help keep the balance on your skin and keep the lashes free to flutter! All-Natural Beauty Alternatives: A life (and money) saver! Overall, it can be scary to actually read the back of your health and beauty products. However, reading is believing, and we need you to know that you can take control of what goes on your body! Look for these and other all-natural beauty alternatives through our blog! 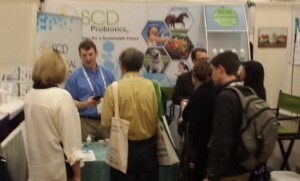 This year, SCD Probiotics® had the pleasure of attending Natural Products Expo West, which is the world’s largest expo of its kind. 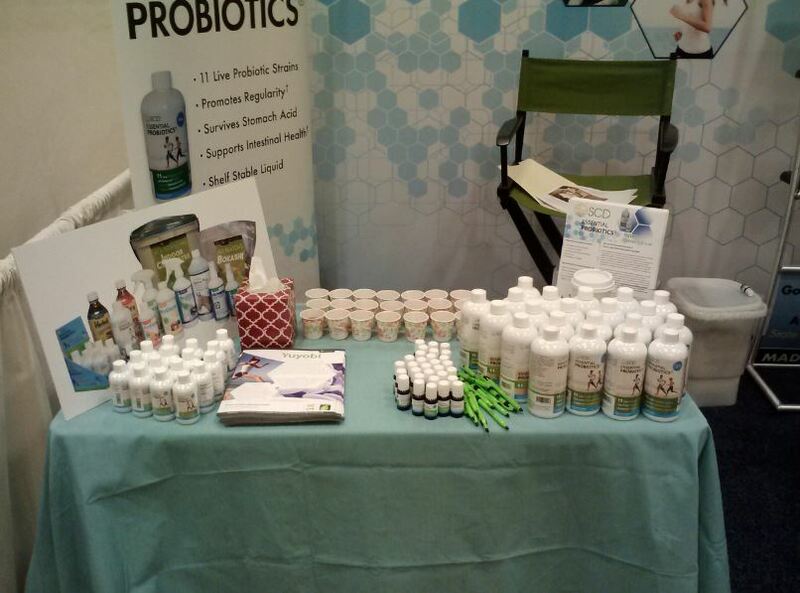 Positioned in the Hot Products area of the Hilton in Anaheim, California, we met lots of great, like-minded people. In Booth H305, we had the opportunity to showcase some of our hot, new products, including Yuyobi ™ Ginger, Yuyobi™ Original, and SCD Essential Probiotics®. Check out that awesome banner! 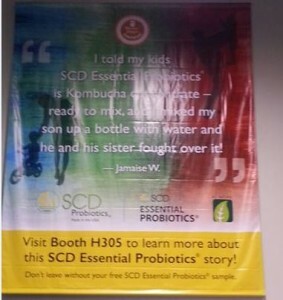 We wanted Expo West attendees to learn about the experience of a happy mommy blogger who has sampled SCD Essential Probiotics®. Our probiotics-rich samples and inviting team members kept lots of smiling faces coming to our booth all day, throughout the entire Expo. 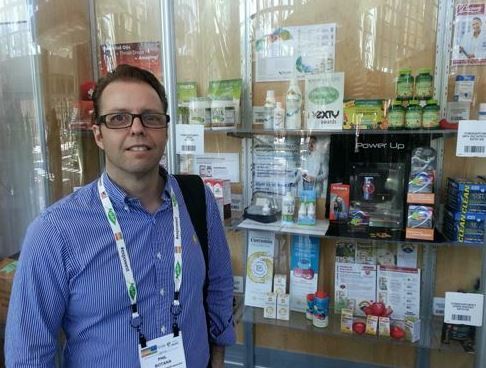 Here is an Expo team member checking out our mini bottles of SCD Essential Probiotics® being featured in the Products Showcase for Supplements & Herbals. Guess what! These bottles are perfect for travel and fit well in any carry-on. And, if you were not able to visit us in Booth H305 at this Expo, look for us at other upcoming expos of this kind. We look forward to staying connected. For the latest news, follow us on our corporate Twitter and Facebook.